Simple example Live set with Analyzer and MIDIator. Spectral flux of the input signal will control Reverb Decay Time. Since we use only one input and it modulates its own reverb, the setup is not crossadaptive, but rather just an adaptive effect. The basic setup can be extended by adding more input channels (and Analyzers) as needed. We do not need to add more MIDIators until we’ve used up all of its modulator channels. I’ve created a simple Live set to show how to configure the analyzer and MIDIator in Ableton Live. There are some small snags and peculiarities (read on), but basically it runs ok. In our example setup, we’ve enabled one modulator on the MIDIator. This is set to receive spectral flux from Analyzer 1, and send this modulator data to midi channel 1, controller 11. We’ve mapped this to Reverb Decay Time on the effect return track. Input sounds with high flux (which means that the sound is probably a bit noisy) will have long reverb. Sounds with low flux (probably a tonal or stable sound) will have short reverb. On my computer (windows), I need to open the MIDIator editing window to force it to start processing. 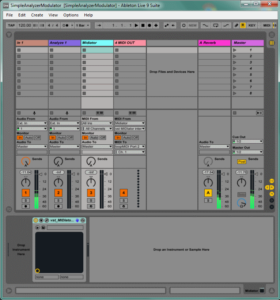 Take care *not* to close the MIDIator window, as it will somehow stop processing when the window is closed (This only happens in Ableton Live, not sure why). To get rid of the window, just click on something in another track. This will hide the MIDIator window without disabling it.